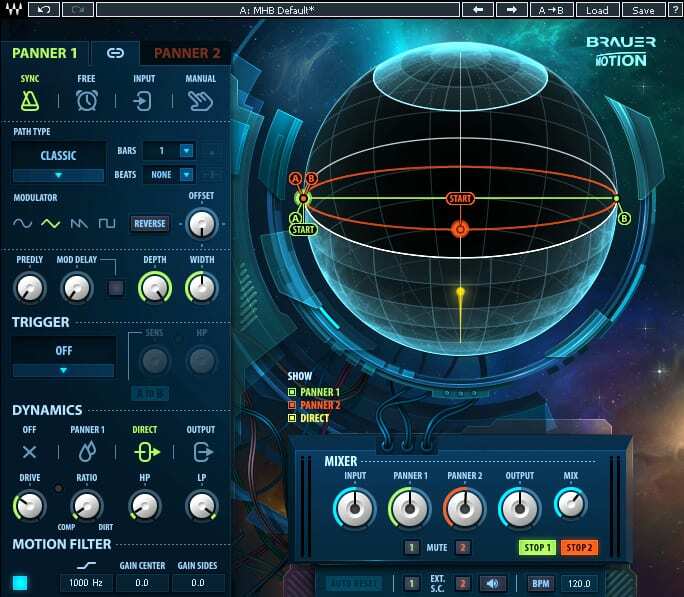 Create an unprecedented world of movement inside your mixes with this circular stereo auto-panner designed with top mixer Michael Brauer (Coldplay). Few people understand how to add emotional movement to a mix in the way that multiple Grammy®-winning mix engineer Michael Brauer does. The man behind top-selling albums from Coldplay, John Mayer, James Bay, Elle King, Florence & the Machine, My Morning Jacket, Bob Dylan, Hall & Oates, Aretha Franklin and countless others, Michael has a deep understanding of how you can use movement to energize a mix. Brauer Motion takes Michael’s mastery of the sound spectrum and lets you control the movement of your sounds unlike anything else in your toolkit. It works especially well on rhythmic tracks such as percussion and acoustic guitar; on swelling pads and organs; or whenever you want to pull the listener in with subtle or drastic panning movement. This super-creative plugin comes with four different panning modes to direct the motion of the sound; four different trigger modes for a variety of on/off options; two panners with full control; a dynamics section; pre-delay, motion filter, and precise control over the speed, width and depth; and a master section with gain and wet/dry controls. Producers, mix engineers and sound designers will all have a blast creating tracks with Brauer Motion. An audio instrument designed to inject excitement and wonder to your mixes, the creative limits of this plugin are as far as you can take them. Brauer Motion includes presets from top mixing engineers including Michael Brauer, Dave Pensado, Tony Maserati, Mark Ralph, Ross Hogarth, Tom Elmhirst and Yoad Nevo. Featuring 64-bit support, faster scanning, faster loading, and faster processing, Waves Version 9 opens up new dimensions of high performance plugin power. All Waves purchases and upgrades include one full year of Waves Update Plan coverage.